Editor's’ note: The below recommendations are intended to be general recommendations for yoga practitioners and teachers. They are not a replacement for the personal advice of a health professional. Frozen shoulder syndrome (FSS), or adhesive capsulitis, is a disorder in which inflammation and scar tissue surrounding the glenohumeral (shoulder) joint and a lack of synovial fluid restrict the ability of the humerus to move in the socket, causing varying degrees of immobilization and pain. For the unlucky two to five percent of the general population who experience FSS, the combination of shoulder immobility and pain make some of the actions of daily life, and many of those required in yoga practice, difficult or even impossible at certain stages of recovery, which is often slow. Among the movements that may be limited are external rotation (for example, reaching back as in a tennis serve or to grab the inside of the back ankle—palm facing out—in dancer’s pose), internal rotation (required for the position of the lower arm in cow face pose), and abduction (moving the arm to the side and then overhead, as in a snow angel or at the beginning and end of a sun salutation). “The severity of pain varies from patient to patient,” says Reif. For some, it can be constant, worsening toward the end of the day or with certain movements, it can be intense enough to interfere with sleep and work, and it can cause depression and changes in weight. Though medical research has yet to pinpoint a clear cause of FSS, there are a few things that are known. It is unlike arthritis; other joints are unaffected. It generally affects only one shoulder at a time, and certain people are more susceptible to it. Though medical research has yet to pinpoint a clear cause of FSS, there are a few things that are known. FSS is more common in those over forty, and it occurs more frequently in women. A prior shoulder injury may be the culprit. In some cases, it’s been associated with both muscular inactivity and deterioration of the cervical spine. Those with diabetes seem to be particularly vulnerable to the disorder. Consistent with the statistics, Reif has noticed that in his several decades of practicing physical therapy, the majority of his patients with FSS have been female and middle-aged or older, reported a recent, minor injury to the shoulder area, and presented with a slumped posture—namely a forward head, forward-rounded shoulders, and increased thoracic kyphosis (rounded upper back). They have also had one more thing in common, notes Reif: “All of them were helped by making improvements to shoulder and neck alignment.” A yogi himself, he sees the potential for yoga to reinforce the alignment that may play a role in preventing and healing frozen shoulder. Unfortunately, yoga done less carefully also has the potential to exacerbate the misalignments and even cause the injuries that could play a role in frozen shoulder. Below, we’ll look at some of the pitfalls yoga presents for vulnerable students and then consider its potential to help prevent and even heal frozen shoulder. Imagine one possible scenario: A new student comes into a large group vinyasa class. She has noticeable thoracic kyphosis, which has moved her shoulders forward and down and shortened the back of her neck. She may experience mild shoulder or neck pain from time to time but has never been “injured” and does not seek out help from the teacher or know to be cautious when making any particular movements. She’s been inactive recently but, encouraged by recent articles extolling yoga’s benefits, is confident that yoga is a safe and beneficial form of exercise. This student then moves through a vinyasa class replete with planks, chaturangas, and downward facing dogs. She feels discomfort in one shoulder the next morning but nothing terrible. She keeps doing yoga, returning for five, ten, or twenty more classes. In some of these, she may even work her way into some challenging arm balances. Soon, the pain in her shoulder is more intense and continuous, and before long she cannot move her shoulder or her arm in certain directions. In short, in the hypothetical scenario above, the repeated compressive force on our student’s misaligned shoulder joints and cervical spine caused wear and tear that, in her case, developed into frozen shoulder. In the example above of the new yoga student with noticeable thoracic kyphosis, the misalignment of the shoulders might be glaringly obvious. But a mild rounding of the spine and misalignment of our shoulders—or those of our students—might not always be so noticeable. Because of the time we spend sitting in chairs, working on computers, and driving, most of our shoulders are to some degree too far forward, down, and inwardly rotated, a position in which they are vulnerable to injury. Even for the rare few whose shoulders are perfectly positioned, by the twentieth or thirtieth vinyasa of the practice, fatigue can cause misalignment. Practicing—and, for teachers, cuing—optimal shoulder placement throughout the entirety of yoga class is valuable to prevent the kinds of injuries that might in some cases develop into FSS. But it’s possible that some students with chronically rounded shoulders cannot hold the poses of the vinyasa or similar poses—at least not for very long, or repeatedly—while keeping the alignment described. 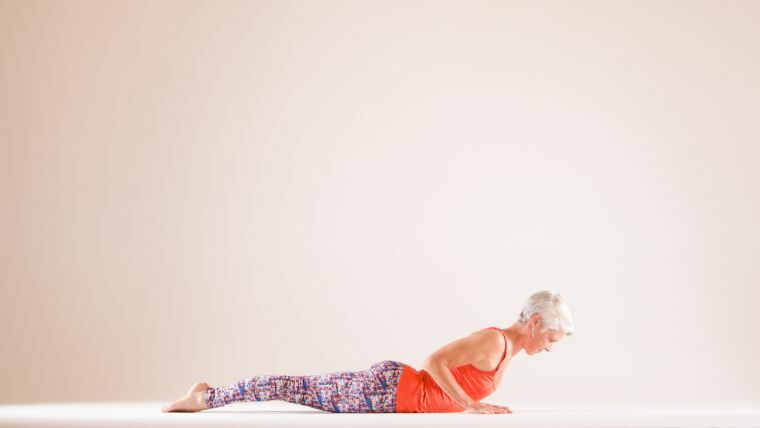 Reif recommends that, until students can maintain optimal shoulder alignment in a pose like tabletop, for example, they should skip or modify the poses of the vinyasa (plank, chaturanga, upward facing dog, downward facing dog) and also forego poses like crow, shoulderstand, and handstand. The most helpful practices for these students are those that work to optimally align the shoulders and neck (like these). 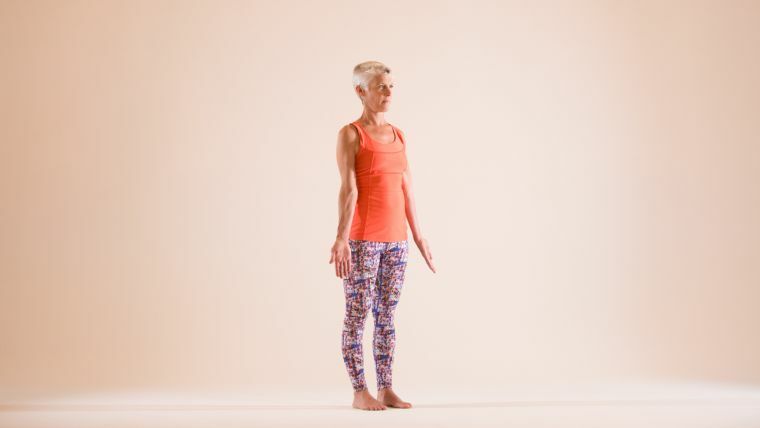 And, of course, if a pose causes pain in the shoulders or neck—or anywhere—the student should come out of the pose and take a break or seek a modification. The most helpful practices for these students are those that work to optimally align the shoulders and neck. What about students who are already in pain when they enter yoga class? “If a student has just started to have shoulder pain and has already lost some motion, it would be inadvisable for them to challenge that arm or shoulder in any way until the actual diagnosis has been made,” says Reif. Those experiencing shoulder pain and loss of range of motion should consult with a physical therapist, osteopath, or chiropractor who can diagnose the problem and recommend treatment. To prevent injurious shoulder compression, it’s important to align the shoulders and the neck before asking the hands and arms to bear weight. The rotator cuff muscles—supraspinatus, infraspinatus, teres minor, and subscapularis—not only stabilize but also mobilize the shoulders, abducting them as well as internally and externally rotating them, and assisting with some movements of the shoulder blades. Because the poses below—mountain, tabletop, plank, chaturanga, baby cobra or upward facing dog, and downward facing dog—recur frequently in many yoga classes, it’s especially important to do them with optimal shoulder alignment to avoid repeated stress on the shoulder joints. Mountain pose is a great asana in which to begin to discover the optimal shoulder alignment that may stave off some injuries. To find your ideal shoulder and neck position in mountain, Reif advises shoulder rolls: Lift the shoulders up an inch or two, move them back, then pinch the shoulder blades together on your back, and repeat several times. Those who wish to refine their shoulder placement can add more detailed actions like lifting the top of the sternum (breastbone) and externally rotating the upper arms so that the biceps and inner elbows point forward slightly. Having positioned the shoulders, move the head back until the ears are aligned with the shoulders (or as close to that alignment as you can comfortably bring them), tucking the chin just enough to keep the back of the neck long. “Imagining a string pulling you up by the crown of the head can help lengthen a compressed neck,” advises Reif. 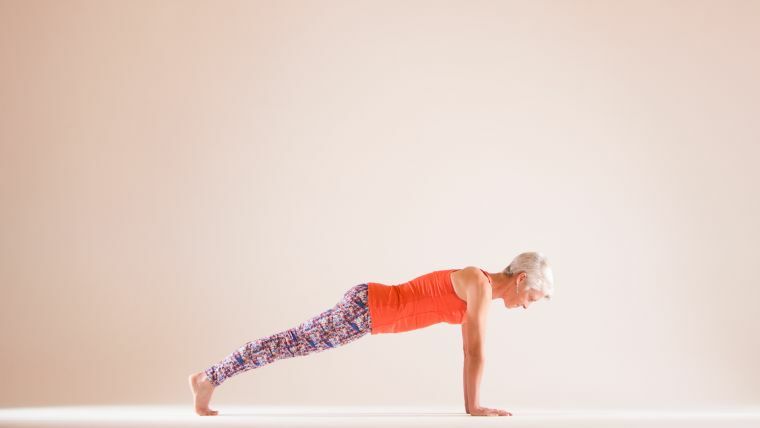 Tabletop is a good pose to set up optimal shoulder and neck alignment while bearing some weight in the hands, and the alignment here serves as a template for the more demanding weight-bearing poses like plank and chaturanga. In a hands and knees position, allow your shoulders to move slightly toward your ears, then drop the chest toward the floor until the space between the shoulder blades hollows out slightly and the shoulder blades can move toward each other. Externally rotate the upper arms, turning the inner elbows and biceps forward (until the “eye” of the elbow points toward the space between the same-side thumb and index finger). Instead of letting the head droop—or cranking the chin forward—draw the chin in enough to keep the back of the neck long as you bring the ears and shoulders in line. Imagine a string teasing the crown of your head forward. 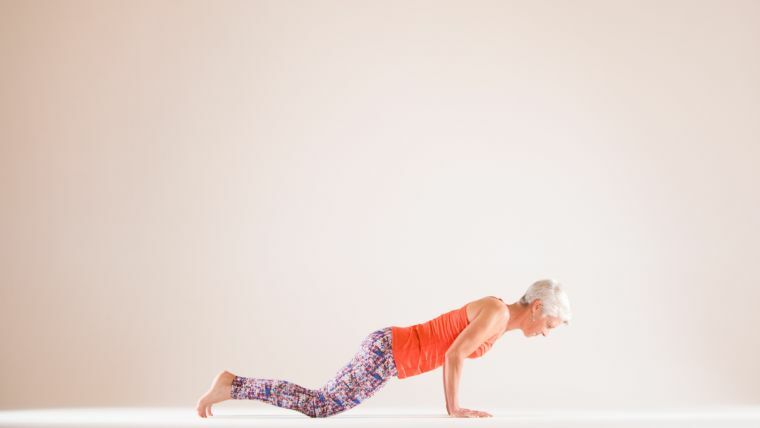 When moving into plank pose, keep the alignment of the shoulders and neck you found when in tabletop. Step just one foot back at first, continuing to draw the shoulder blades toward each other and externally rotate the upper arms slightly. Resist the temptation to drop the head as you step a foot back: Instead, make sure to keep the ears and the shoulders in line, drawing in the chin slightly and reaching through the crown of the head to keep the neck long. If you tend to round the upper back, it might be safest to work on chaturanga with the knees down rather than knees lifted. While still sinking the chest toward the floor, working to draw the shoulder blades toward each other, and encouraging a slight external rotation of the upper arms, try bending your elbows by only a few degrees. Never come so low that the shoulders dip toward the floor or climb up toward the ears. Watch the tendency of the head to droop or the chin to move forward; keep the back of the neck long as you move your ears in line with your shoulders and reach forward through the crown of your head. In baby cobra, cobra, or upward facing dog, the shoulders often tip forward in front of the collarbones. Try lowering the chest a bit (decreasing the backbend); then move the shoulders up, take them back, and draw them toward each other. Continue to externally rotate the upper arms slightly, work to keep the ears in line with your shoulders, and keep the neck long by lowering the chin slightly and lifting through the crown of the head. The student who can comfortably move into downward facing dog should do so while keeping a slight external rotation of the upper arms and allowing the shoulder blades to move freely. In other words, though the shoulders themselves do move down, and the medial borders of the shoulder blades (the parts closest to the spine) lower, the lateral (outside) borders of the shoulder blades move up toward the hands. While ideally these movements happen as a natural part of the “scapulohumeral rhythm,” students accustomed to being instructed to move their shoulder blades down their backs, or students with postural difficulties that have disturbed this rhythm, may benefit from being encouraged to lift the shoulder blades toward the hands (while lengthening through the crown of their heads to keep the backs of their necks long). However, downward facing dog might not feel good for the students with marked thoracic kyphosis: For these students, hands and knees is a better place to work. ‌• The “freezing” stage: This period lasts several months, starts with pain, and develops into limited mobility. ‌• The “frozen” stage: Over these several months, pain eases but movement may become more limited. Reif cautions his patients to approach yoga with extreme care during stages one and two. “Many of the poses in yoga that require the arms to lift or move behind the back, or the hands to bear weight, can worsen the pain and even cause more mobility losses,” he says. It is important that yogis take things easy in these stages and do nothing that causes them pain or pushes them into the restricted range. Restorative yoga is fine, as long as the shoulders are made comfortable, and so is a practice that emphasizes lower body work and allows the affected arm and shoulder to stay in a comfortable position. In stage three, things change. 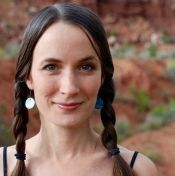 “In stage three, I recommend yoga [asana] participation,” says Reif. “While students may still be restricted in their ability to move the ‘frozen’ shoulder and arm, pushing slightly into a new range of motion at this stage can be beneficial.” Students should still avoid pain in the course of movement, but it would be normal for there to be some soreness after a practice. That soreness is acceptable at this stage, according to Reif, and can be treated with ice. You will need a wall, a strap or belt, and an exercise or therapeutic ball (6 to 20 inches). Stand with your back toward a wall, and place an exercise ball or therapeutic ball between you and the wall so it supports your lumbar curve. Hold a yoga strap or belt at waist height in front of you, with your palms facing up and your wrists smooth, hands about three feet apart, and the eyes of your elbows facing up. Pull on the belt until it’s taut, pinch your shoulder blades together, and press your lowest back ribs into the ball. Keeping your arms straight and your upper arms externally rotated, slowly, over the course of several breaths, raise both arms overhead, allowing the shoulder blades to lift as the arms come higher than the shoulders. To keep the back of your neck long, imagine that string pulling you up by the crown of the head. Hold the upward reach for a few breaths, continuing to press the lowest back ribs against the ball and keep tension on the strap. Stand in mountain pose with your back against the wall. Start with your arms at your sides, palms against your thighs. 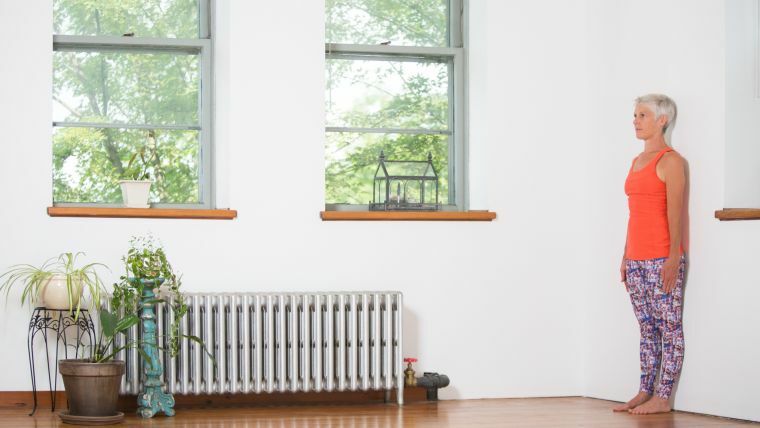 Keeping your arms as close to the wall as possible, slowly lift them out to the sides and up to the height of your shoulders, palms facing down. Pause there. Externally rotate your upper arms so that your palms and the eyes of your elbows face the ceiling as much as is comfortable. Then, lift your arms as high as possible, allowing your shoulder blades to lift. Hold here for a couple breaths, lifting the crown of the head up to keep the back of your neck long. Slowly lower the arms until they are once again in line with the shoulders, then turn the palms down, and bring your arms down the rest of the way. For a movement that uses partial body weight to assist in an overhead reach, set yourself up on the floor in tabletop pose, hands below shoulders and knees below hips. Sink the chest toward the floor, draw the shoulder blades together, and turn the eyes of your elbows to point toward the space between your index finger and thumb. Move from hands and knees into child’s pose, sinking your hips as close to your heels as you comfortably can and allowing your shoulder blades to move toward your hands. Hold here for a couple breaths, reaching through the crown of your head to keep the back of your neck long. Shift forward again, then move back ten times, moving your hips closer to your heels each time.